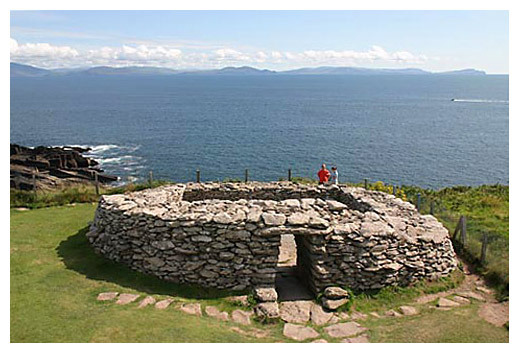 The Iron Age is typified in Ireland and especially in Kerry, by promontory forts. This fine example is Dún Beg, Slea Head, Dingle Peninsula. This was a ‘foggy’ time between history and pre-history. There is no archaeological evidence to support the existance of a ‘Celtic’ race. In ancient Irish literature there is no mention of them. The Greeks used the word ‘Keltoi’ for the people that lived north of the Alps. To the Greek there was them and the rest were barbarians. In the 19th century archaeologists used ‘Celts’ to explain everything from Stonehenge to Newgrange – even though they were built thousands of years before their Celtic period. Either way, Newgrange etc ‘couldn’t be the work of the Irish’. How does the Bible intepret the begining of time? How did we get labeled as ‘Celtic’? In the 19th century culture was labeled according to archaeology. The La Tene culture descended from the Hallstatt culture. The Hallstatt people acted as middle-men between the Meditteranean region and the other regions. The La Tene culture and ideology spread accross Europe but not necessarily the people. Linguists say Irish is an Indo-European language. This assumes an Indo-European people living in southern Russia – by coincidence where the Garden of Eden is supposed to be. This is more ‘biblical theory’. David Green says the Irish language is the sum of the languages of the people of these islands. Language has been used to unify people and to segregate people. The unification of Germany in the 19th century was based on all those who spoke German. In 17th and 18th century France and Britain the rulers saw the Irish, Welsh, Scotish and people in Brittany as troublesome, illogical and unable to govern themselves. The Celts were seen as dreamers, good with music, stories and poetry. The British saw the Romans as giving them the edge and the right to build an empire. We pedal the leprecaun stuff but it’s origins are racism. However, Irish Nationalists turned these ideas around to show that we are different and used folklore etc to show our glorious past. Hitler did something similar. The origin of the Celtic label may also be related to the fact that about 50 Hallstatt swords (c.700-500 BC) we found here. These were used as ‘proof’ of a Celtic invasion. However, the swords were bronze, the Hallstatt swords are iron. The branding of ourselves as ‘Celtic’ can be damaging as it excludes people. The ‘Celt theory’ is very much based on the theories of the Anglo Irish of the 18th century who had a vested interest in seeing themselves as the end of a long line of invaders. Does not the La Tene art found in Ireland prove we are Celtic? No. The La Tene art found here in the early Iron Age (500 BC – 1 AD) is insular – it has an Irish spin on it – a local variation. The evidence points to a continuation of design and technology from the Bronze Age into the Iron Age rather than any invasion. When it was first discovered or used, iron was probably expensive but when it was known that it was common place the value probably dropped. It is very difficult to see the advancement of iron tools etc because what we usually find is a ball of rust. These are mostly male, most or all are adults. One theory is that they were placed in bogs to be suspended between worlds where they wouldn’t decay. Or maybe they were put their in the same way as the weapons were ‘decommissioned’. What helped to preserve the bodies was the cold, the lack of oxygen and the acidic conditions which kill the bacteria in the body. One scientist described it as ‘slow cooking’. A local example is Emlagh Girl dating from the 17th century. She was found near Dingle. Her clothes and hair were preserved, as was a small bag in her hand which contained a comb and a little ball. Her bones had turned into turf. Good sites were continuously reused so we sometimes get Iron Age forts built on Bronze Age structures. This can be seen at Navan Fort (Eamain Macha). Hill forts continued from the Bronze Age into the Iron Age. Dún an Óir was even used in the Desmond rebellion. Dún Aonghasa, Dún Beg, Caherconree are all good examples. The Romans arrived in Britain in 55 BC. Although it was said that Ireland could be taken with just one legion, we were never invaded by them. We do however know that Romans probably came here as Roman coins etc have been found here in places like Newgrange. Using a text based on the latin, these stones are mainly headstones, giving the lineage of the deceased. We get ogham appearing as early as the 3rd century AD. This was quite considerable. From this period on we have a new type of plough, new vegetables. The mode of dress changes – tunic covered by cloak. Literacy, technnology and religion also came with the Romans.